We’d love your help. Let us know what’s wrong with this preview of الطابور by بسمة عبد العزيز. To ask other readers questions about الطابور, please sign up. Umm.. so a chapter or so into the book, I began googling Basma Abdel Aziz to determine if she was still alive. Definitely, a residue of my being born and spending my childhood in a totalitarian country, for certainly a book like this would never have been published in the formerly communist Eastern block. Or, if somehow it had escaped the censors, I have no doubt its writer wouldn’t have escaped the gulag. Except perhaps, if such a book would have caught the eye of an English translator and had Umm.. so a chapter or so into the book, I began googling Basma Abdel Aziz to determine if she was still alive. Definitely, a residue of my being born and spending my childhood in a totalitarian country, for certainly a book like this would never have been published in the formerly communist Eastern block. Or, if somehow it had escaped the censors, I have no doubt its writer wouldn’t have escaped the gulag. Except perhaps, if such a book would have caught the eye of an English translator and had made its way to the West; this English publication may indeed be in some way, an insurance policy. It’s much more impractical for people surviving totalitarian dictatorships to “disappear” if someone somewhere out in the world cares or is at least aware of their existence. Now, you know those games, that ask you to ponder, “If you had an hour to chat on a bench/over coffee with anyone alive or dead, who would you choose?” Usually I come up with the usual, you know, Barak Obama, the grandma who passed before I was born, but now..? Now this is a woman I’d be so incredibly honored and grateful to meet. The fire that must drive her to write such critiques from within such adversity is probably the one quality I admire most in people: undeterred, passionate – exuberant even – determination to resist and battle injustice, at any cost. Back to the book. The Queue is a brilliant allegory/surreal tableau of life in an authoritarian regime. The narrative is composed of a pastiche of impressions from individuals, named and unnamed, fully drawn out and also only brief apparitions of ‘characters’ (archetypes) that may inhabit such a landscape. There is a doctor, torn between his duty to save lives and directives from the government; there is the garrulous neighbor-informer; there is a woman who dares stand up for what she believes in until she loses everything, at which point she turns towards feverish compliance, even to the extent that she begins converting others to the governments’ cause (and many more). The novel, as the goodreads blurb describes it, is Kafka-esque, in that it displays the absurdity of things-as-they-are through a surreal rendition of phenomena; but a more accurate description I believe would be Bulgakovian and Nabokovian, the distinction being the ethos of the work as grounded in the particular absurdity of totalitarian control over individual lives (not the more generic, “life is absurd” of Kafka, but a very specific, “life under authoritarianism is absurd”). And, like all Bulgakovian and Nabokovian romps, Basma Abdel Aziz’s work is not only tragic, but laugh-out-loud-hilarious (though not in any “western” way that would probably resonate as humor in the US, for instance). It’s a different type of humor, a tongue-in-cheek sarcastic dead-pan that could also come off as very serious to some (I personally subscribe to this kind of humor and consider myself a person who is very much able to take a joke but 99% of my American friends don’t get this and still treat me like I’m the most serious person they know…). An example: Abdel Aziz describes a woman who is refused service by her baker, and he asks her, “Who did you pick?” at which point she tells him “I checked the box next to the candidate with the pyramid symbol….Told me I needed to apply for a certificate- I forget what it’s called- the one with a government stamp, ‘cause they’ll be sure to ask me for one when my complaint gets investigated…” On one hand, this could be read as a serious and tragic conversation but, for someone like me, used to communist Romanian humor, this read as the funniest exchange I’d encountered in a while – not to mention that the underhanded critiques implicit in every word are pure brilliance. [More at my reading journal if anyone's interested. I can just picture someone somewhere reading the back-cover blurb of this book where it says "The Queue is a chilling debut that evokes Orwellian dystopia, Kafkaesque surrealism,..." and wondering why he/she should read it if it's done before. Well, it's certainly true that there are a lot of books that focus on people faced with the absurdities of a totalitarian government, but in this book, what strike Frankly, this is one hell of a good book. I can just picture someone somewhere reading the back-cover blurb of this book where it says "The Queue is a chilling debut that evokes Orwellian dystopia, Kafkaesque surrealism,..." and wondering why he/she should read it if it's done before. Well, it's certainly true that there are a lot of books that focus on people faced with the absurdities of a totalitarian government, but in this book, what strikes me is how optimistic some people are in believing that despite everything, if they just wait long enough, the state will take care of their problems. Never mind that the Gate, the bureaucracy which is the unseen "absolute authority" in this unnamed country, is never actually open to the citizens -- although rumors abound as to when it might open, people have been waiting long enough for help that a huge queue has formed and continues to increase in size while nobody ever seems to move. Meanwhile, the Gate continues to issue laws dictating that people will need permission from the state for an ever-growing number of activities, some as absurd as can be, but people continue to wait with some measure of hope for what they need. And it's in the queue, really, where life goes on -- there are rules to be followed, commerce taking place, religious activities and activists, protests going on, and information being disseminated -- so that at some point, the queue becomes a society in its own right. The Queue is an interesting new take on the dystopian genre, which manages to balance hyper-reality with a sense of surreal absurdity. It is set in an unnamed authoritarian state, where citizens are at the mercy of a central authority figure called The Gate. Bureaucracy is extreme – citizens need authorization for the slightest need (eye test, anyone? )– and in order to gain this, they must join the queue at The Gate. More and more people join the queue, but The Gate never seems to open, despite The Queue is an interesting new take on the dystopian genre, which manages to balance hyper-reality with a sense of surreal absurdity. It is set in an unnamed authoritarian state, where citizens are at the mercy of a central authority figure called The Gate. Bureaucracy is extreme – citizens need authorization for the slightest need (eye test, anyone? )– and in order to gain this, they must join the queue at The Gate. More and more people join the queue, but The Gate never seems to open, despite the rumours. The book contains a variety of different characters who have joined the queue for different reasons. The main character, Yehya, must obtain permission to have a bullet removed from his abdomen – an injury we are told he received during the Disgraceful Events. Unfortunately, the government denies that any bullets were fired, and issues more and more preposterous propaganda to convince citizens that the events did not occur! This is a thought-provoking book that may well leave you with more questions than answers. A recommended read! In a non-specific Middle Eastern setting, life in a city is governed by 'the Gate', both an actual structure and a symbol of authoritarian rule. Citizens are instructed to queue outside it for permits and certificates for everything from job applications to medical treatment. The Gate, however, never opens – it's often rumoured that it's about to, but all that happens is that more new laws are imposed; the queue grows longer and starts to turn into a permanent fixture. All this takes place in th In a non-specific Middle Eastern setting, life in a city is governed by 'the Gate', both an actual structure and a symbol of authoritarian rule. Citizens are instructed to queue outside it for permits and certificates for everything from job applications to medical treatment. The Gate, however, never opens – it's often rumoured that it's about to, but all that happens is that more new laws are imposed; the queue grows longer and starts to turn into a permanent fixture. All this takes place in the aftermath of a failed uprising, always referred to as 'the Disgraceful Events'. As with many things in this story, the absurd moniker is amusing but also grating, and these effects are only amplified as it echoes through the text. There's an almost bewilderingly large cast of characters, some of whom are given names, while others are simply defined by a single feature throughout the narrative ('the man in the galabeya', 'the woman with short hair'). The dominant thread is about a man named Yehya who needs a special permit for an operation to remove the bullet lodged in his pelvis; while his health declines, the Gate issues an edict effectively declaring bullets nonexistent. Over and over, Yehya and the others return to the queue. Frustrating repetitiveness is a deliberate feature of the way the story is told, underscoring the bureaucratic hell the characters have to put themselves through day after day. In The Queue, we see the many different ways in which authoritarianism might undermine and, ultimately, destroy an individual. Rebels and conformists alike are subsumed by the regime. One particularly disturbing example is Yehya's friend Amani, whose efforts to track down a missing X-ray result in a punishment so nightmarish it rubs out her identity, leaving a blank slate who parrots Gate slogans. Amani's ordeal is the most powerful sequence in the book; the aftermath is a devastating portrait of the effects of trauma. The Queue ends not with a bang but with a downbeat sigh. It's a simultaneously farcical and believable portrait of life under autocratic rule, with tiny glimmers of hope as a community forms within the queue. This novel is set in an unnamed Middle Eastern Country, although the author lives in Cairo and has written several works of non-fiction speaking out against oppression and torture in Egypt. In this book, there is a totalitarian regime, symbolized by the mysterious Gate, to which all citizens must apply for permits for almost everything. The main story line features Yehya, a man who was shot during the so called Disgraceful Events, and has a bullet in his stomach. The book follows him and his frie This novel is set in an unnamed Middle Eastern Country, although the author lives in Cairo and has written several works of non-fiction speaking out against oppression and torture in Egypt. In this book, there is a totalitarian regime, symbolized by the mysterious Gate, to which all citizens must apply for permits for almost everything. The main story line features Yehya, a man who was shot during the so called Disgraceful Events, and has a bullet in his stomach. The book follows him and his friends as they try and arrange surgery to have the bullet removed, but they are stymied at every turn by the necessity of having permission from the Gate to have it removed, if you can believe that. And the Gate is never open so people wait for weeks and months in the queue, hence the book's title. This is the story of how an authoritarian government works. History and reality are rewritten to tell fit the truth the government decides will work best to keep its citizens in line. Fear is used to control the masses. Surveillance in many forms is everywhere and is constant. Tarek is a surgeon. As the book begins, he is reviewing the file of a patient he treated in the emergency room the night the "Disgraceful Events" began. The patient had been shot. After getting the x-rays and observing a b This is the story of how an authoritarian government works. History and reality are rewritten to tell fit the truth the government decides will work best to keep its citizens in line. Fear is used to control the masses. Surveillance in many forms is everywhere and is constant. Tarek is a surgeon. As the book begins, he is reviewing the file of a patient he treated in the emergency room the night the "Disgraceful Events" began. The patient had been shot. After getting the x-rays and observing a bullet lodged near the patient's kidneys, Tarek had determined it needed to be removed, but before he began the surgery, two things happened. First, a colleague reminded him that he could not remove a bullet without obtaining special permission, and second, his patient and all the others being treated after being injured in the Disgraceful Events were removed to the military hospital. Tarek is unable to keep this patient from haunting him. The book is divided into six parts. Each part begins with a part of the patient's file -- Document #1 is titled "patient information"; Document #2 is titled "time, location, circumstances of the injury; Document #3 is titled "Examinations Conducted, Visible Symptoms, and Preliminary Diagnosis;" Document #4 is titled "patient's history;" Document #5 is titled "the Gate's response;" and Document #6 includes a "Follow-up" and "Notes." Tarek keeps the file in his office at the hospital and broods over it. It seems that almost every time he looks at it, something has been changed or added. Tarek becomes increasingly distraught over this patient. The patient, with his best friend, joins the "Queue" that is lined up before the Gate because he has to get a document from the Gate before he can get the surgery he needs. The Gate, however, was closed after the Disgraceful Events and has yet to reopen. As the laws and regulations keep changing, more and more people find themselves needed to obtain something from the Queue and the line grows until it stretches for miles. Groups form within the Queue, a coffee shop opens within the Queue, boycott's arise and countered within the Queue. For weeks and months, the Queue grows but the Gate has yet to reopen. The patient's girlfriend tries to help him get the x-ray he needs as part of his application for a permit to get the ever-moving bullet removed. This book starts slow. It is unclear at first what is going on - why are people in this line and why does it keep growing? But as the book moves forward, the stories of some of those in the Queue are told, as well as what their day-to-day life is like now that they are in the Queue. A couple of the thoughts that kept running through my head as I read this book were (1) the high profile stories about President Obama not being an American citizen and being Muslim (both attempts to rewrite the truth) and (2) how average German citizens were kept in line during Hitler's rule. This is a frightening book. The story it tells has great relevance in today's world. جرعة مكثفة من البؤس.. منعتني النوم، وضاعفت اكتئابي.. This was a fascinating dystopian novel. It takes place in an unnamed city in the middle east where there is a centralized authoritarian control known only as "The Gate" Citizens are required to obtain permission for just about anything from the gate. The problem is the gate never seems to open so people have to wait in the most ridiculous queue ever and they never really get anywhere. Our main character, Yehya, has an even bigger problem. He needs permission from the gate to have a bullet remove This was a fascinating dystopian novel. It takes place in an unnamed city in the middle east where there is a centralized authoritarian control known only as "The Gate" Citizens are required to obtain permission for just about anything from the gate. The problem is the gate never seems to open so people have to wait in the most ridiculous queue ever and they never really get anywhere. Our main character, Yehya, has an even bigger problem. He needs permission from the gate to have a bullet removed. Only the events that led to him getting shot never happened, according to the gate. The Queue is built on historical precedence set by Arab Springs. The foundation of the story lies in the changing climate in the middle east with its revolt against authorities, outing fundamentalism and greater exposure to social media. The globe watched more closely than ever when an entire nation protested against their government and changed history forever. This book is set during one such moment in history where the revolt against government fails, and fails for the worse. The building tha The Queue is built on historical precedence set by Arab Springs. The foundation of the story lies in the changing climate in the middle east with its revolt against authorities, outing fundamentalism and greater exposure to social media. The globe watched more closely than ever when an entire nation protested against their government and changed history forever. This book is set during one such moment in history where the revolt against government fails, and fails for the worse. The building that houses government is barricaded and the gate to enter this complex is closed. People form queue in front of this gate since getting permission to access anything - X-Ray, food, access, is fully controlled by the government. The Queue follows a group of citizens who find themselves in a position to ask permission from government for their continued survival. When religious fundamentalism is added to the mix, few of the characters have direct consequences on their everyday life. Aziz takes her readers on a slow journey into lives of people who are everyday people like you and me. There aren't grand gestures, grandiosity or overt use of political turmoil. The protests against the government is an occurrence that exists in edges of the pages - unforgotten but never unwritten. The complexities of life under an absolute authoritarian rule isn't blatantly obvious to those who go about their day without questioning, protesting or be in need of an outside help. But a simple question to a baker can get citizen the boot and deny them food in future. That, is the true problem of regimes like these. The middle men, the ones who are on the ground and provide everyday service, with little to less power grow corrupt faster and make the life of people more difficult than it already is. Aziz touches many aspects of this kind of government - a government that rules with utmost authority but essentially doesn't care much about well being of its citizens. The book setting isn't really Kafkaesque or Orwellian. Its far worse. The nature of dystopia as Kafka and Orwell imagined was rooted in history. What Aziz portrays isn't very far from reality and probably some of it is already in place in different parts of geographies. People, in general are distracted and don't realize the little installments of freedom we have started signing off to our governments. The story opens in an unnamed Middle Eastern city with Dr Tarek Fahmy reviewing the file of his patient Yehya Gad el-Rab Saeed. Said patient had come to him for the removal of a bullet in his groin, received during an uprising that has come to be known as the Dis This was a challenging but in the end quite affecting novel. The author, an Egyptian journalist, is also a psychiatrist who treats victims of torture. Excellent credentials for writing a novel about the impact of government oppression. This was just an okay read for me. I don’t think it was the book- I think it was the mood I was in while reading it. This is a dystopia about a world ruled by a mysterious gate that popped up out of nowhere one day and began issuing laws and decrees. At first people expected the Gate to be a good thing, but then the horror slowly dawns on them as the laws get stricter and stricter, forcing people to jump through numerous hoops to get anything done. Mostly it follows a character named Yehya and his This was just an okay read for me. I don’t think it was the book- I think it was the mood I was in while reading it. Mostly it follows a character named Yehya and his friends. Yehya has a bullet stuck in him because the Gate has decreed that no bullets shall be removed without authorization from the Gate. So he waits in the Queue to get permission. Unfortunately the Queue isn’t moving. The Gate still issues laws and amendments. But no one who needs anything from the Gate ever seems to get what they need. The ending is extremely ambiguous and I feel pretty cheated. Like I waited in the Queue for warm croissants but by the time I reached the front all they had was day old bread. I do think the author did a lot of interesting things with the concept of the Queue. It seemed to take on a life and economy of its own. I feel as though it was all part of the Gate’s grand design but I couldn’t tell you to what end. مثقف محبط، صحفى ثائر، متطرف دينى، إمرأة مكافحة تنبش فى التراب بحثا عن الرزق، شخص مصاب برصاصة فى صدامات ثورية ويرفض النظام علاجه أو حتى الاعتراف بإصابته، شعب بالكامل اختزلت حياته وأحلامه فى طابور طويل طويل بلا نهاية، وسلطة غاشمة جاثمة تستبد بالجميع..
العمل الثانى الذى أقرأه لبسمة عبد العزيز بعد دراستها المهمة "إغواء السلطة المطلقة" إلى جانب مقالها الدورى فى الشروق، والرواية هنا تنتمى لنفس العالم الذى جاءت منه أعمال أدبية ك "1984" أورويل و"451 فهرنهايت" برادبورى وفى أدبنا العربى "أسفار الفراعين" لف مثقف محبط، صحفى ثائر، متطرف دينى، إمرأة مكافحة تنبش فى التراب بحثا عن الرزق، شخص مصاب برصاصة فى صدامات ثورية ويرفض النظام علاجه أو حتى الاعتراف بإصابته، شعب بالكامل اختزلت حياته وأحلامه فى طابور طويل طويل بلا نهاية، وسلطة غاشمة جاثمة تستبد بالجميع..
العمل الثانى الذى أقرأه لبسمة عبد العزيز بعد دراستها المهمة "إغواء السلطة المطلقة" إلى جانب مقالها الدورى فى الشروق، والرواية هنا تنتمى لنفس العالم الذى جاءت منه أعمال أدبية ك "1984" أورويل و"451 فهرنهايت" برادبورى وفى أدبنا العربى "أسفار الفراعين" لفشير و"يوتوبيا" لأحمد خالد توفيق، حيث المستقبل كابوس أسود وحكم سلطوى لا حد لاستبداده وتفننه فى قمع مواطنيه..
روايه معقولة و جيده تقع في عالم موازي لفانتازيا چورچ أورويل و أجواء يوسا المليئون بالاسقاطات علي الواقع ، يمكن سقف التوقعاتي هو اللي كان عالي اوي ، عشان كده شفتها مملة في بعض اجزائها و كان ممكن تكون مشوقه اكتر من كده ، عموما افضل جزء بها هو ربعها الأخير بغض النظر عن النهاية . I finished this book today and I feel like I just got off a roller coaster. This is a dystopian novel, but it's also horror. The Gate is meant to keep people "in line" all the while you have people recording citizen's every move. There's one specific passage that terrified me like no other book has done. Although the first 100 pages were confusing, the second part of the book made up for it. The people in this book are scared, but the scarier part is that they are adapting. They are living. Even I finished this book today and I feel like I just got off a roller coaster. This is a dystopian novel, but it's also horror. The Gate is meant to keep people "in line" all the while you have people recording citizen's every move. The people in this book are scared, but the scarier part is that they are adapting. They are living. Even as the government rewrites history, the people go along with it. This book gave me shivers. Initially when I began reading this, it read like a number of other dystopian novels, with exposition and a bit of world building (although the novel is set in the present-day Middle East, so we're not talking a big fantasy world build). But then it just kept going. Day in and day out, describing the lives of people under an authoritarian regime who are waiting in line outside of a government office that never opens. After the initial backdrop was placed, I began to get a bit bored. I realized I Initially when I began reading this, it read like a number of other dystopian novels, with exposition and a bit of world building (although the novel is set in the present-day Middle East, so we're not talking a big fantasy world build). But then it just kept going. Day in and day out, describing the lives of people under an authoritarian regime who are waiting in line outside of a government office that never opens. After the initial backdrop was placed, I began to get a bit bored. I realized I was waiting for some hero or heroine to arise, take on the evil regime, and topple it. But that didn't happen. This book is much more concerned with portraying the daily reality under conditions of oppression. The disbelief, anger, and resignation at each new, absurd government edict or pronouncement. People have been in the queue for months, always hopeful that today is the day the gate will open. Only once does someone take on the government, and the outcome leaves her a shattered shell of her former self, unable to sleep, afraid of her own shadow. No plucky heroines are found here. There is a pivotal scene in which one of the characters describes the nothingness in which she finds herself. In a few pages, we are led into a directionless void, no scent, no texture, no communication. I found it terrifying. Together with the 6 documents we are presented with throughout the book, I was made to feel the horror and the tension these characters faced in this world. And I had to ask the question of how people are able to communicate with one another under such a faceless, burdenso There is a pivotal scene in which one of the characters describes the nothingness in which she finds herself. In a few pages, we are led into a directionless void, no scent, no texture, no communication. I found it terrifying. Together with the 6 documents we are presented with throughout the book, I was made to feel the horror and the tension these characters faced in this world. And I had to ask the question of how people are able to communicate with one another under such a faceless, burdensome power. The author writes of a mysterious government that gives a whole new meaning to the phrase "keeping people in line" through the eyes of several fascinating characters. The queue is long, but not orderly. No, the men and women jump forward if they can, leave, come back, live a sort of hazy life. Here in the queue, a kind of communication does takes place, in contrast to the silence of the Gate. Until the Violet Telecom becomes a player in the game. If you expect answers reading this superb book, you won't find them. Questions. There are questions here, questions I found to be stimulating and very satisfying. After a failed popular uprising called the Disgraceful Events, the autocratic crackdown that results has citizens waiting in the unending Queue to receive permission from the Gate for basic things, from rights of citizenship to removing a bullet. Aziz's writing is very Orwellian, and is inspired by the Arab Spring. This review has been hidden because it contains spoilers. To view it, click here. The Queue is a dystopic realist novel, set in an unnamed Arab city. The narrative explores the suffocating and maddening nature of bureaucracy in an authoritarian society. The titular “queue” never moves forwards, and keeps growing every day, as more people line up to reach “The Gate”. The technology described in this novel is the never-ending wait in the queue. Abdel-Aziz uses the process of waiting, and indefinite time periods required to get “approval” for simple tasks, to explain the futilit The Queue is a dystopic realist novel, set in an unnamed Arab city. The narrative explores the suffocating and maddening nature of bureaucracy in an authoritarian society. The titular “queue” never moves forwards, and keeps growing every day, as more people line up to reach “The Gate”. The technology described in this novel is the never-ending wait in the queue. Abdel-Aziz uses the process of waiting, and indefinite time periods required to get “approval” for simple tasks, to explain the futility and the suppression in this society. Rather than an elaborate or mechanized technology, the state uses time in a weaponized way, which eventually leads to the violent death of Yehya, the protagonist. Abdel-Aziz describes an almost Orwellian system of governance, however, the society in this story feels distinctly Arab. The individual characters’ development is built upon established tropes and stereotypes in Arab cultures. It is clear to see the connections between this novel and the unfolding political situation in Egypt, where Abdel-Aziz is from, in the post-Arab Spring context. This book can be interpreted as a critique of a current/former despotic regime, but also as a warning for future societies. What struck me, as a reader, was the insidiousness of the “evil” in this novel. It showed that the state need not be explicitly aggressive to be dangerous. Rather, a wilfully negligent government can be as destructive as a militarized society. “The Queue”, by Egyptian author Basma Abdel Aziz, tells the tale of a dystopian society where citizens are rigidly controlled by an invisible authoritarian government. In order to receive authorization for just about any task, men and women must line up for weeks on end in front of an administrative Gate. One of the citizens anxiously in wait of an authorization is Yehya, a young man recently shot during a government rebellion. 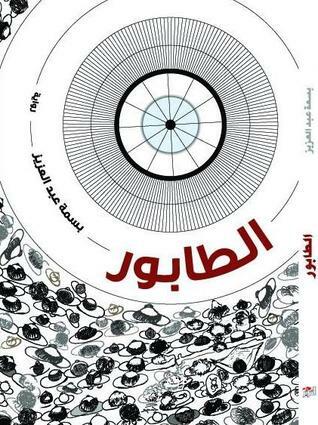 Yehya is slowly dying from the bullet lodged in his body, however, as “The Queue”, by Egyptian author Basma Abdel Aziz, tells the tale of a dystopian society where citizens are rigidly controlled by an invisible authoritarian government. In order to receive authorization for just about any task, men and women must line up for weeks on end in front of an administrative Gate. One of the citizens anxiously in wait of an authorization is Yehya, a young man recently shot during a government rebellion. Yehya is slowly dying from the bullet lodged in his body, however, as per his government’s restrictive laws, no bullet can be removed without permission from the state. A good dystopia with a zoomed view and a varied cast. It was an interesting read even if the story or the society weren't amazing or really new. Indeed, the narration was very focused, zooming only on several characters, making it difficult to completely grab what was happening at the society level. I enjoyed to discover piece by piece the dystopia this way, it kept me interested all along and I'd fun when something new was unveiled. The characters weren't a lot developed and I didn't become atta A good dystopia with a zoomed view and a varied cast. I thought this to be quite unique, quite brilliant. An uprising sees a strange unseen government in place. More and more rules are enacted which require the citizens to seek approval from "The Gate". The only problem is "The Gate" is never opened and the queue gets longer and longer. There are bizarre rules such as to get surgery to remove a bullet. This is a book full of Catch-22s, a reflection of tyranny gone wrong and how the masses seem to willingly obey even the most extreme laws. The Queue is an important novel. Basma Abdel Aziz deftly weaves a story about the psychological aspects of every day existence of people trying to navigate an oppressive and deceptive regime as it becomes (to some) increasingly clear that they are under 24-7 surveillance. Avoiding any truly gruesome scenes (save for one with a bag full of bloody bullets), but rather implying them in the terrified and slow disintegration of mental and physical health, Abdel Aziz achieves an eerie, haunting atmosp The Queue is an important novel. Basma Abdel Aziz deftly weaves a story about the psychological aspects of every day existence of people trying to navigate an oppressive and deceptive regime as it becomes (to some) increasingly clear that they are under 24-7 surveillance. Avoiding any truly gruesome scenes (save for one with a bag full of bloody bullets), but rather implying them in the terrified and slow disintegration of mental and physical health, Abdel Aziz achieves an eerie, haunting atmosphere. The more the events are rationalized by the authorities and the regime's supporters, the more absurd they seem against the backdrop of the personal and internal suffering of the characters. Still, The Queue does not allow for emotional investment in any character. Perhaps the closest it gets is a strong feeling of injustice and anger for Yehya's situation. At times, the events are so unknown and distanced from the reader that it is hard to connect with the incredible anger, shame, anxiety or disappointment the characters are feeling. This is especially true for Amani, who is the only other character that suffers directly at the hands of the authorities. As a result, though the plot very slowly and effectively turns up the pain dial, there is little satisfaction in terms of emotional story arc. The novel is about, among other things, information wars. In the novel, rumors, misinformation, "official" news, and propaganda are distributed via word of mouth, printed material, and public preaching, and bolstered by official and unofficial threat tactics, which is very much like the low-tech version of the real information wars going on today via the internet and social media. There is nothing new, really, in the misinformation tactics today compared to the ones used centuries and millennia ago, except today the means of delivery are lightning fast and have incredible reach, also allowing misinformation to overwhelm competing information quickly and effectively. A rumor that spreads through the queue in front of the Gate in a few hours would take only a matter of minutes to spread to the far corners of the world via social media. Perhaps this is the most scary big-picture warning in the novel. One of the more interesting points in the novel is when the philosophy lecturer, Nagy, argues that hope is what keeps people in the queue, hope is what makes them compliant and non-confrontational despite the increasingly ridiculous situations they face, hope is what prevents them from fighting against the oppressive regime. Abdel Aziz shows how hope is manipulated by the Gate to continue its rule; not surprisingly, the simplest of these methods is spreading the rumor that the Gate is about to open its doors any day, while that day never seems to arrive. Given where the ‘Arab Spring’ has ended up, reading Basma Abdel Aziz’s The Queue is a rather eerie and dispiriting experience. The dystopian novel is set in an unnamed Middle Eastern city, now entirely governed by a faceless authoritarian regime called The Gate, which has placed its citizens in a chokehold following what is euphemistically referred to as the ‘Disgraceful Events’, perpetuated by the ‘Riffraff’, who protested against the curtailing of their freedoms. The novel follows a broad rang Given where the ‘Arab Spring’ has ended up, reading Basma Abdel Aziz’s The Queue is a rather eerie and dispiriting experience. The dystopian novel is set in an unnamed Middle Eastern city, now entirely governed by a faceless authoritarian regime called The Gate, which has placed its citizens in a chokehold following what is euphemistically referred to as the ‘Disgraceful Events’, perpetuated by the ‘Riffraff’, who protested against the curtailing of their freedoms. The novel follows a broad range of characters grappling with The Gate’s power, none of them especially heroic (with the exception, perhaps, of Amani), which makes the story all the more compelling I think, as it feels so real despite its clear dystopian setting. Abdel Aziz’s background is in psychiatry and she worked for over ten years at a centre that helps victims of torture overcome psychological trauma. It’s clear that she brought this experience to bear on her novel, which focuses so convincingly - and movingly - on the body and psyche and the ways in which power works to control and undermine both.